Here’s a different twist of the usual mod where users modify their computer case so that you can look into the innards of the CPU. 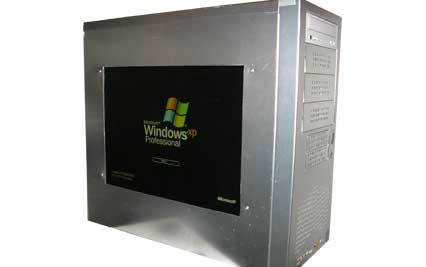 In this version, instead of creating a window looking inside we put in a LCD monitor in the CPU. Which looks really cool. Below is a pic of what it might look like. I have a flat screen sitting under my desk from an old system I bought a couple of years ago so maybe I will try to set this up sometime in the near future when I get some free time. The site has some other really interesting projects also. Check it out if you are interested in DIY projects.